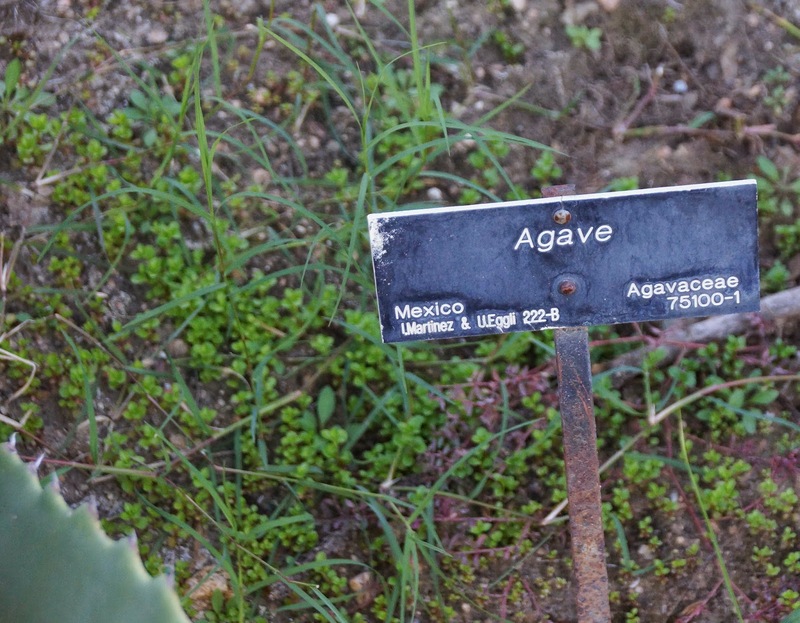 Though I certainly haven't seen every Agave out there to see. The Huntington's is not quite as pretty as mine. I'm not bragging--I had nothing to do with it. The plant did the work. Both have leaves with a slightly scabrous texture. 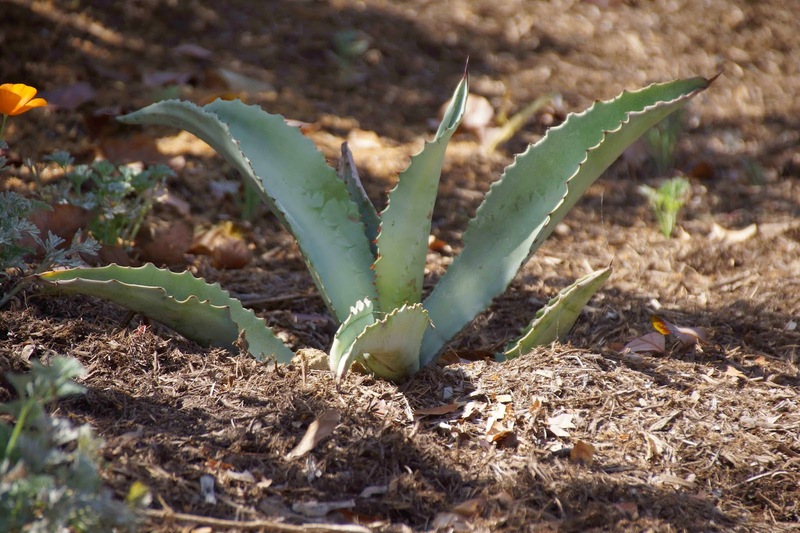 An Agave expert says A. marmorata, because of the distinctive way the newest leaf emerges encircled by the previous leaf. Though of course signs are not to be wholly trusted at botanical gardens, even when they are not very helpful. Not quite the same. 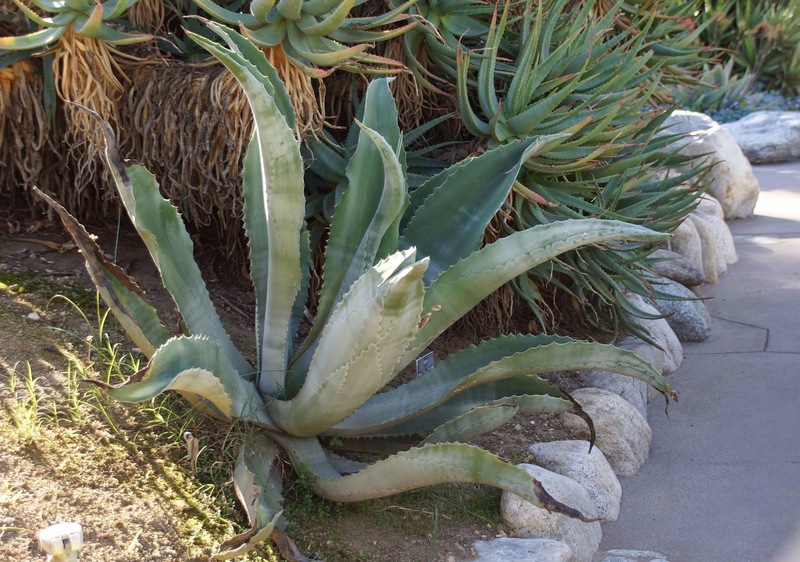 Rancho Soledad says of A. marmorata: "This species is variable with some plants being quite large while others...are of more modest size; some have leaves that are a dusky green and sometimes these leaves are distinctly striped in pale blue while others are entirely green or gray." Not much of an offsetter. I've gotten one other, and it's small. 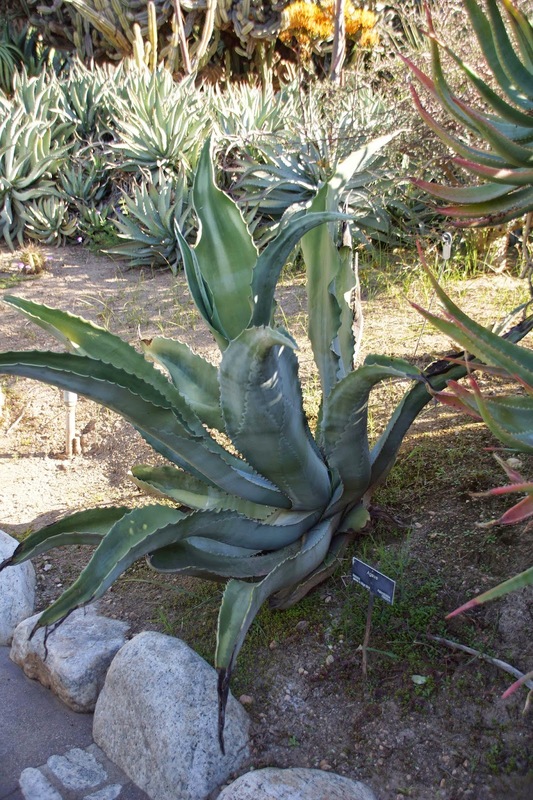 Agaves can vary widely within a single species, sometimes so much so as to fool experts for a while. 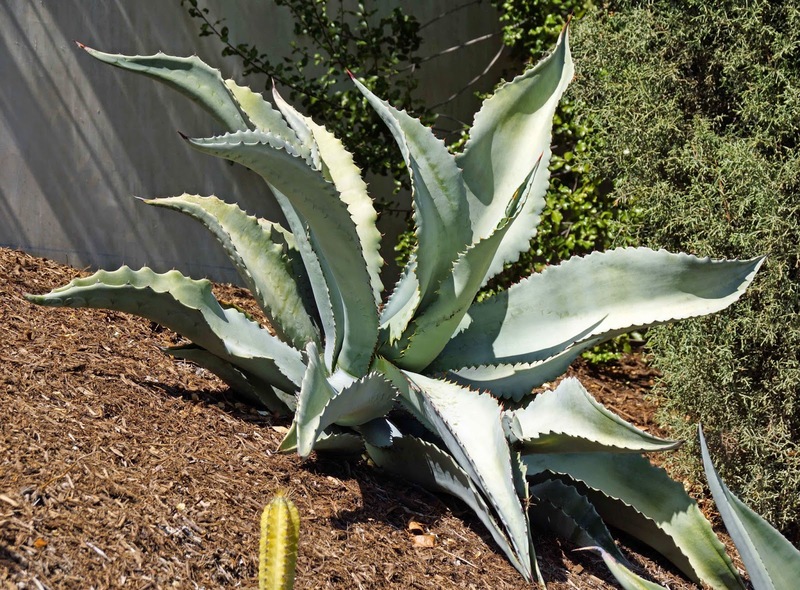 That Agave varies in a good way. 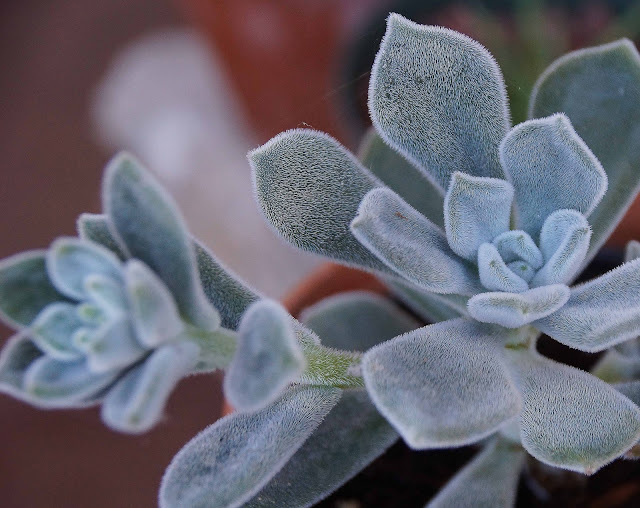 It explains why we often see "selections" of a particular plant for sale--the grower liked it better than all the others--it has some particular virtue (cold hardiness, compact growth) or feature (a more eye-catching color) that others of the same species lack. Good story. Yours in pictures 1 and 4 is certainly better looking and maintained that the one at the Huntington. I had to go outside and check my agaves to see how that new leaf emerged. Parryi 'Rosa Grande', vilmoriniana and attenuata all have the leaves encircled, so I'm missing something. What exactly is distinctive about it? I also found out that "marmorata" means "marbled" which is a good description of the leaves in pictures 1 and 3 up from the bottom. A fun puzzle. As it was explained to me, there was something distinctive about the encircling. I'll have to see if I can find it. The Huntington has much hotter summers, I think that makes a difference. 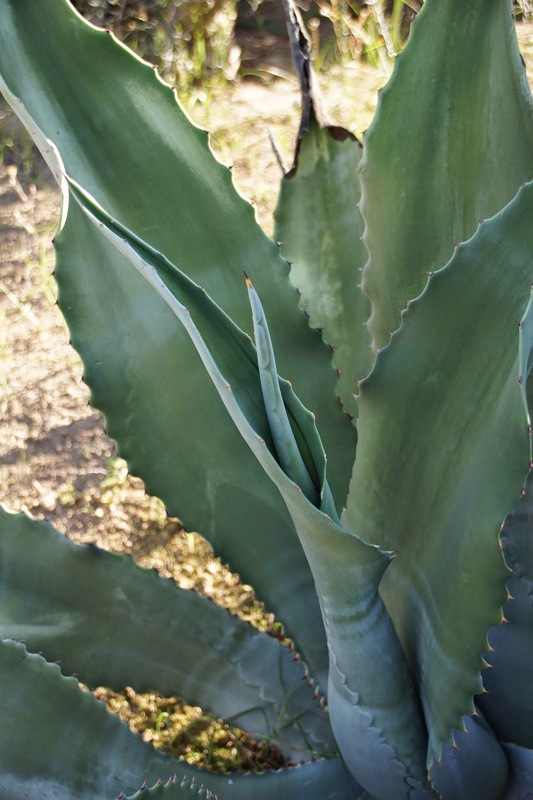 It's quite fascinating to sometimes watch agave experts debate about an agaves identity. Your last paragraph is spot on. And interesting to know the characteristic of marmorata when a new leaf emerges. Having read a few of the expert's debates, it can get--heated! 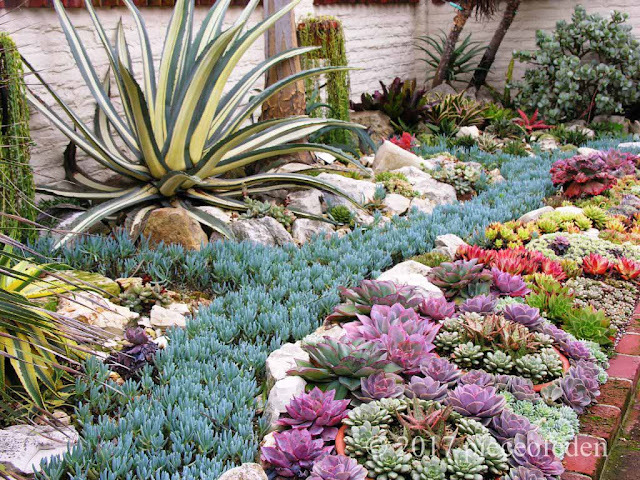 Your Agave is beautiful dear Hoover, I also like your Agave in image #7, it looks wonderful planted amongst the other succulents and the yellow flowering Aloe. It is a beautiful Agave also, if a little less dramatic. I like that one a lot. It really is a beauty, whatever you call it! I actually enjoy going to the garden of an Experienced Gardener and having a conversation that goes something like... Me: "wow, that plant is fantastic! what is it?" EG: "oh that? I've been growing it for 20 years -- it came from my mother's garden, who planted it during the war. All I know is it's an ____ of some kind." Well it just seems like if you had been growing something for 20 years, you'd be a little curious about it, but...life happens! And with the wealth of plant info on the internet these days, we don't remember or realize how difficult it once was to ID plants. Yours is a beauty and looks great on the slope. We visited Peckerwood Garden over the weekend and noted the A. ovatafolia in the garden are very different from ours grown and sold by Yucca do nursery originally founded at the garden. All the variations on details of these plants make them so interesting. There seems to be a lot of variation in ovatifolia, but I've yet to see an ugly one! Vanzie, Frosty Blue, Huasteca Giant, , etc, etc, all so beautiful! Yours is a beautiful agave indeed! Love the sign at the Huntington! Reminds me of a label at our local conservatory which reads "Century Plant" So helpful! Maybe it's better than nothing. Sometimes its a choice between taking care of the plant and fixing the sign--best to take care of the plant. Based on the teeth, I'd say A. marmorata, either entirely or partially. If that's what it is, it's the most beautiful A. marmorata I've ever seen. Some are downright ugly, yours is very elegant. I herewith propose a new name: Agave 'Hoover Boo'. Hah! That's a good name! To be honest, I bought it because it was ridiculously cheap. I don't think it was more than $2. I also never expected it would get so beautiful. Don't you love it when plants surprise you? 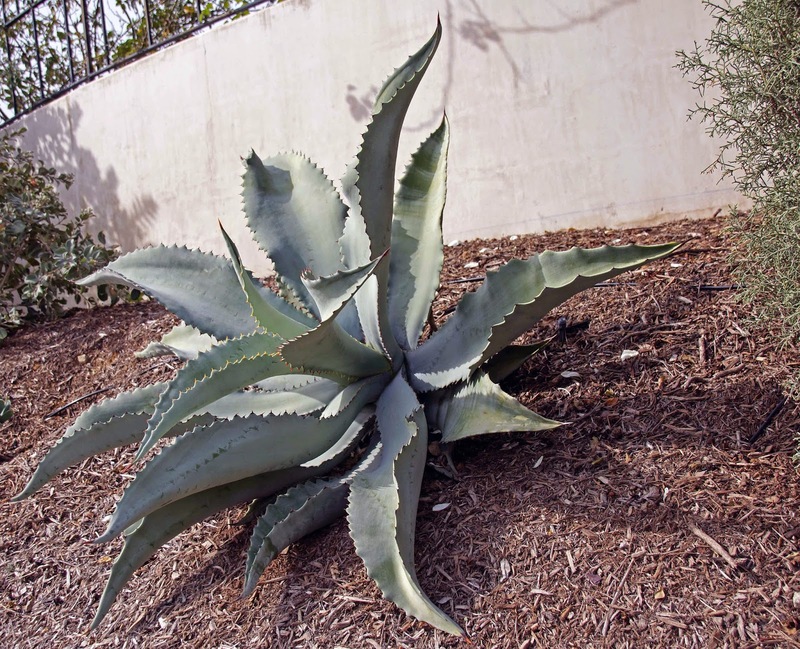 Just shows what an agave can do when you give it a roomy slope to grow on in a favorable climate. And I'm impressed Gerhard knows it by its teeth! By their teeth ye shall know them? It's baby photo certainly has A. marmorata characteristics. What a delicious mystery! Well, after reading the "variable species" thing, the mystery is fairly well cleared up for me. Often it takes a blog post to focus my ever-wandering attention. I always admire your focus--your garden shows it!